MVP – Pageantry Administrator Laureen Oglesby receives the Pageantry Spirit Award from CEO Carl Dunn in recognition of her 20 years of service. 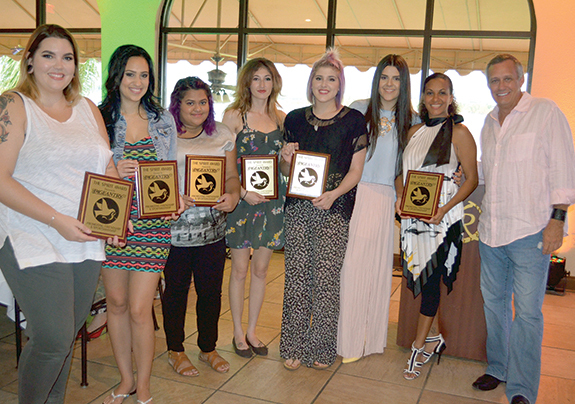 The “A” Team – Team Aveda members Shelby Sullivan, Jessica Thompson, Amber Vickram, Miranda McCaffrey, Miranda Williams, Pageantry Beauty Director Yulia Konstantinova-Riebman, Wilmariel Lozano are presented the Pageantry Spirit Award by Pageantry CEO Carl Dunn following the annual Pageantry & PromTime 2016 Fashion Showcase photo shoot. 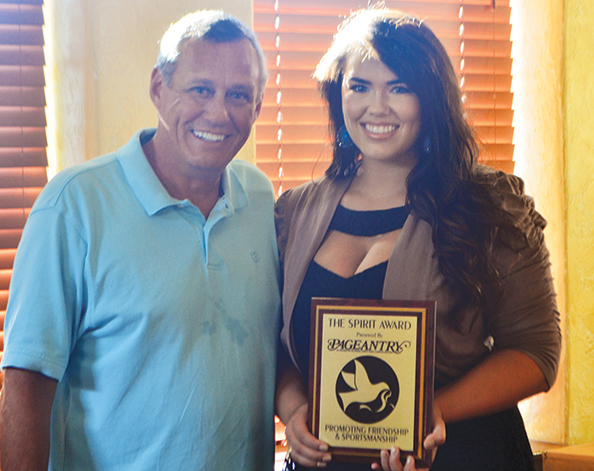 Role Model – Pageantry CEO Carl Dunn presents the Pageantry Spirit Award to showcase model Victoria Sarone for her neverending enthusiasm. 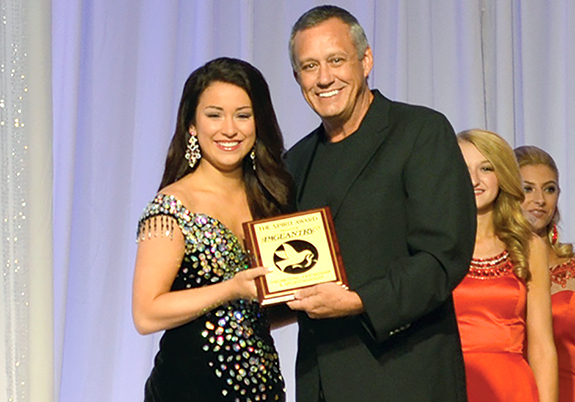 Ruby’s Reward – Alexis Renee Ruby of Georgia receives the Pageantry Spirit Award from Pageantry magazine CEO Carl Dunn who made a surprise appearance at the U.S.A. Ambassador Pageant national finals. 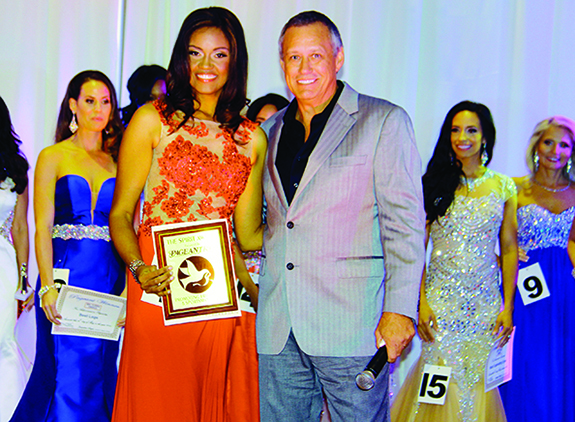 Sunshine Spirit – Pageantry CEO Carl Dunn presents the Pageantry Spirit Award to Kimberly Gibson during the Mrs. Florida Pageant, held at the Westgate Villas in Orlando, Florida. [Photo by Larry Oskin]. 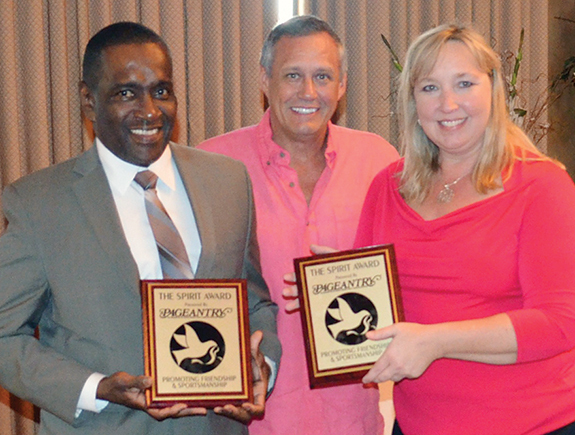 Honored Hosts – Pageantry CEO Carl Dunn presents the Pageantry Spirit Award to Spurgeon Nisbett and Kelly Ann Dixon of the Downtown Bradenton Hampton Inn & Suites following the Pageantry & PromTime photo shoot. 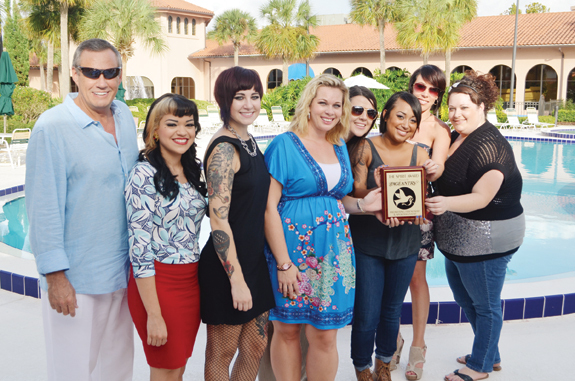 Top Team – Team Aveda accepts the Pageantry Spirit Award from CEO Carl Dunn following the 2015 Pageantry and PromTime fashion shoot. (L-R) Gozde Arisoy, Hillary Stone, Tammy Fischer, and Amanda Ellis. Hey Vern! – Pageantry CEO Carl Dunn presents Vernon DeSear with the Pageantry Spirit Award during the Pageantry & PromTime Fashion Showcase photo shoot in Bradenton, Florida. 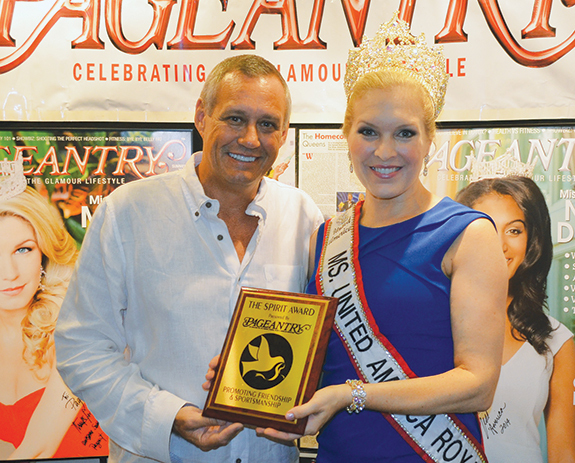 Royal Welcome – Pageantry CEO Carl Dunn congratulates Ms. United America Royal Carolyn Ladd, who recently was presented with the Pageantry Spirit Award during the United America pageant, while in Atlantic City. 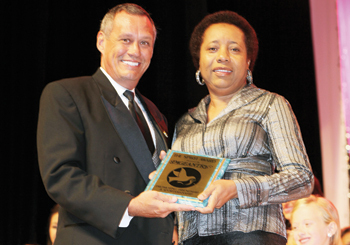 Pageantry Presentation – Dr. Veronica Walters receives the Pageantry Spirit Award from special guest Pageantry CEO Carl Dunn during the Mrs. Florida America Pageant. 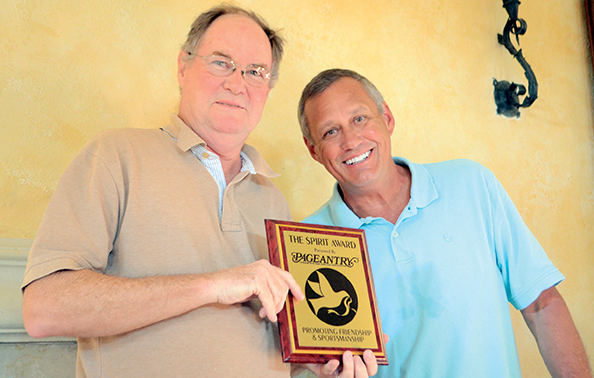 Go West – Photographer Ted West received the Pageantry Spirit Award from CEO Carl Dunn for his many years of dedication. 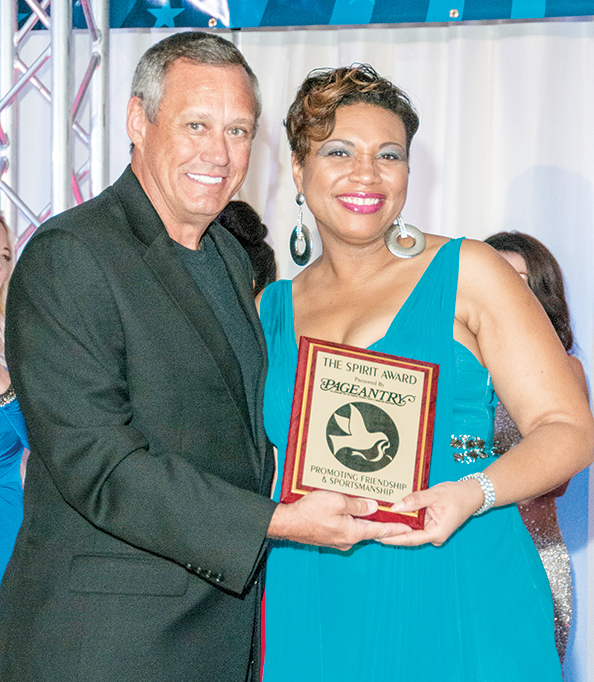 Sommer Loving – Pageantry CEO Carl Dunn presented the Pageantry Spirit Award to assistant beauty director and former PromTime cover model Sommer Isdale. Best in the Business – Pageantry’s Carl Dunn presented the Pageantry Spirit Award to the best beauty team in the glamour lifestyle industry: (L-R) Emily Pole, Jules Beecher and Emily Pellegrini. 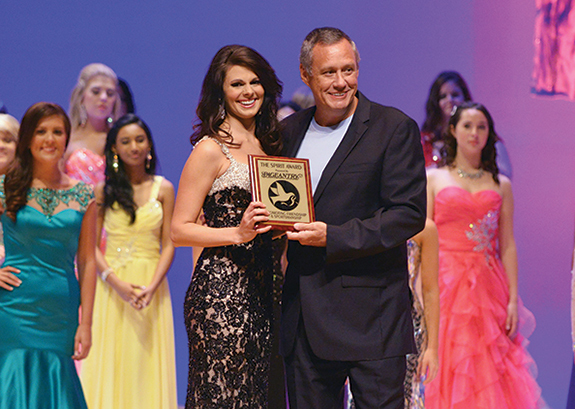 Straight from the Source – Pageantry CEO Carl Dunn was on hand to present the Pageantry Spirit Award to Kristen Murphy during the Royal International Miss pageant finals in Orlando, Florida. 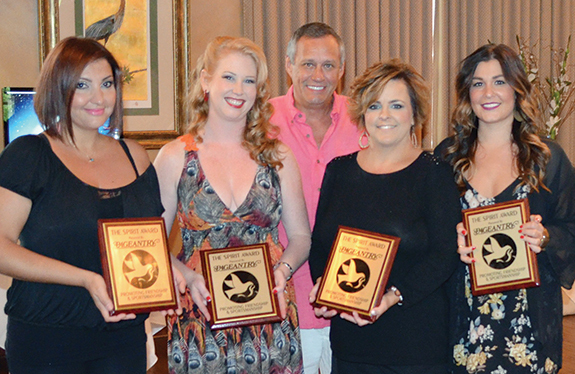 Showcase Salute – Pageantry magazine CEO Carl Dunn was proud to present the Pageantry Spirit Award to the hard working hair and makeup crew for the Pageantry & PromTime 2013 Fashion Showcase. (L-R) Lead Makeup artist Shantell Tavarez, Emily Pole, Amanda Hodges, Yulia Konstantinova Riebman, Kaisha Lorden, Lead Hairstylist Kristy Schanel, and Julie Beecher. The week-long photo shoot was produced at the Westgate Lakes Resorts in Orlando, Florida and is the world’s largest on location photo shoot for Prom, Pageant, and Social Occasion gowns. 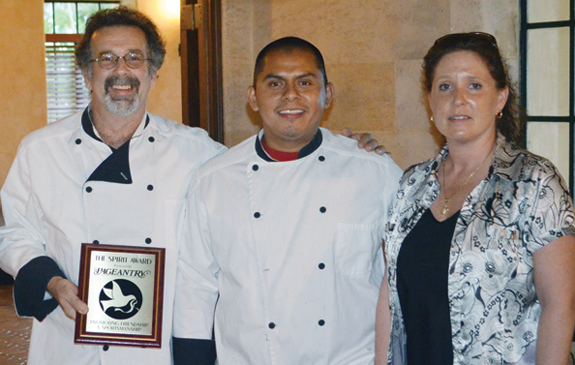 Chef’s Choice – (L-R) Chef Sean Connelly, Sous Chef Juan Barrera, and Event Manger Maribeth Liberty of the Powel Crosley Estate accept the Pageantry Spirit Award for their outstanding attention to culinary perfection in hosting the Pageantry & PromTime 2012 Fashion Showcase photo shoot. Hairs To You – Team Aveda receives their Pageantry Spirit Award for their distinguished attention to detail in performing the hair and make up stylings for the Pageantry & PromTime photo shoot. Recognized (L-R) Angela Cardona, Yahaira Rosario, Whitney Weatherington, De’Jeanee Harmon, Shantell Tavareres, Erin Stutes, and Kristy Schanel. The Aveda Institute has been the official hair and makeup team for the Pageantry & PromTime Fashion Showcase photo shoot since 2009. 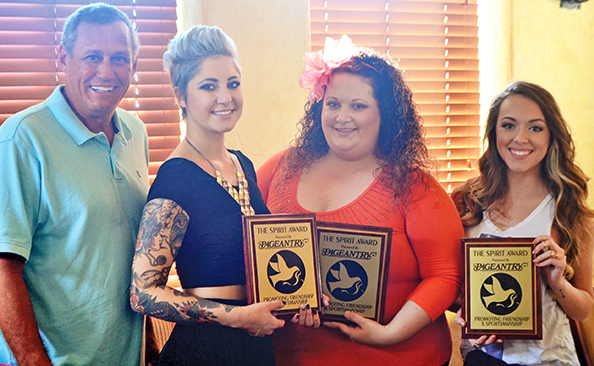 Fashion Icons – Makeup artists Summer Posey (L) and Stephanie Barnes (R) receive the Pageantry Spirit Award from Pageantry CEO Carl Dunn for their outstanding work during this year’s Fashion Showcase photo shoot. 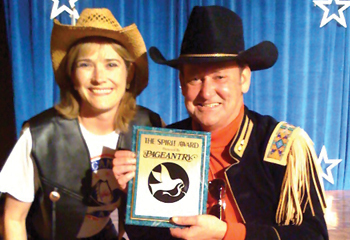 Tireless Tribute – Before the divisional crownings at the International Junior Miss Pageant in Orlando, Florida, Pageantry CEO and IJM judge Carl Dunn was beckoned to the stage to present the Pageantry Spirit Award to Johnie Hamilton for her tireless efforts on behalf of the International Junior Miss organization. 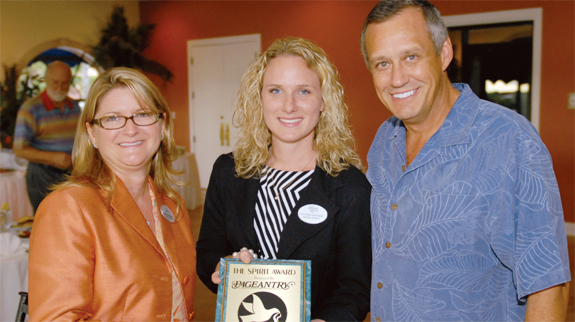 Westgate Winners – For their tireless efforts in support of the Pageantry & PromTime photo shoot, David Siegel (L) and Jacqueline Siegel of Westgate Resorts accept the Pageantry Spirit Award from Pageantry CEO Carl Dunn during the 2010 Fashion Showcase wrap party. Beauties Behind the Beauty – Accepting the Pageantry Spirit Award from Pageantry’s Carl Dunn for a job well done during the 2010 Pageantry & PromTime photo shoot are the makeup team from the Aveda Institute and Myriam Fux (C) of Xposure Cosmetics. 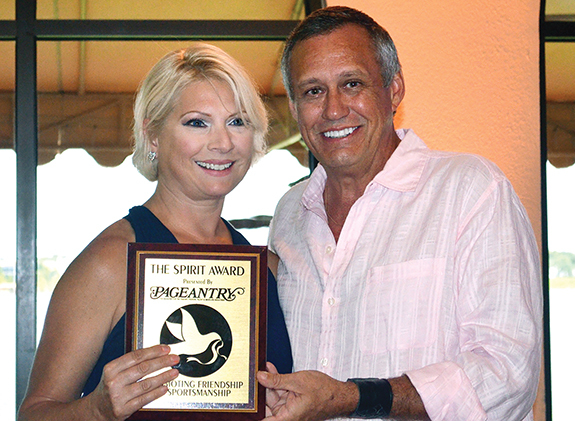 Into the Sunset – Retiring American Coed choreographer Carter Butler receives the Pageantry Spirit Award from President Patricia Hawkins in appreciation of more than 30 years of dedication to the pageant industry. 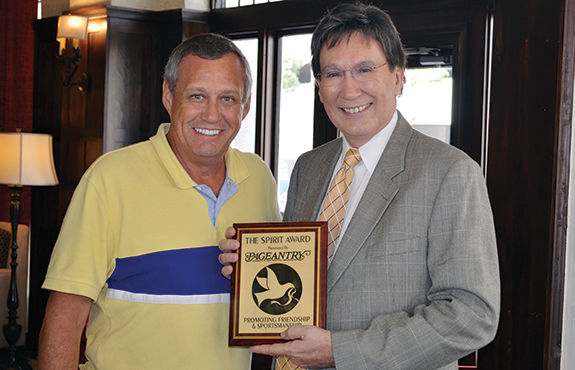 Directors: Click here to find out how to present the Spirit Award at your event! These simple but profound words by Ralph Waldo Emerson embody the true meaning of personal growth and character. In all that we strive to achieve and become, ultimately it is our character that will have the greatest affect on those with whom we come into contact on a daily basis. Competitive events have always offered an opportunity for personal growth and character development, not usually apparent in the everyday aspects of our life. With this in mind, Pageantry magazine has created a remarkable award — an award that acknowledges outstanding qualities such as character, achievement, personal growth, and a willingness to promote the positive aspects of competition. 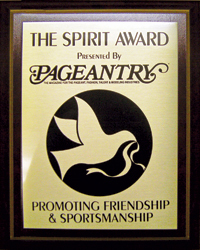 The Pageantry Magazine Spirit Award best represents Pageantry‘s mission statement of promoting friendship, sportsmanship, and character development. In presenting this award, Pageantry magazine strives to acknowledge those who exemplify the true “spirit” of competition and character development, whether it be individuals who compete or those who lead and direct by example. Both types share their success and triumphs with others. 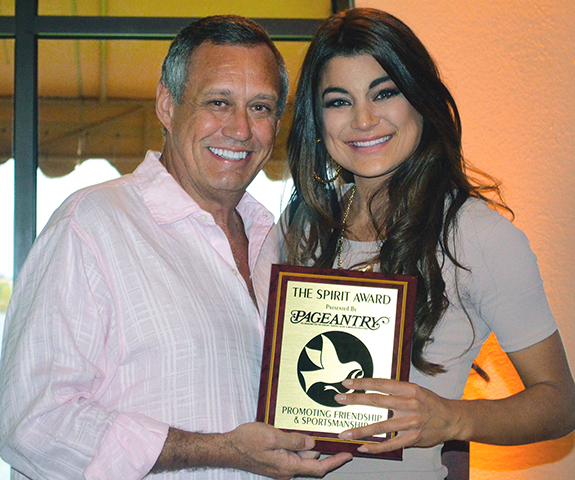 By bestowing the Pageantry Magazine Spirit Award, Pageantry magazine will continue to recognize and promote those deserving individuals who, by their selfless actions and deeds, have a profound and positive influence in the lives of those they touch.